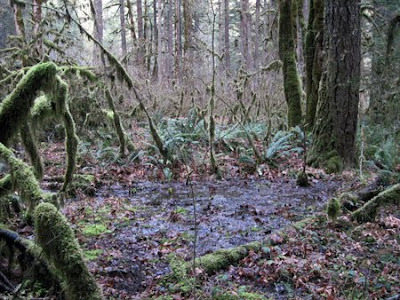 Recently, I went on a scouting trip to a 'squatchy location south of Portland. I've been looking closely at this area since fall, having taken numerous day trips and even spending a few nights there. So far, I have little to show for the time I've spent there, but that's not to say that nothing bigfooty has happened. While I do admit that almost nothing has happened, I did get return vocalizations from a nearby roadless area last October on one very chilly night. The recorder we had running in camp was too far away to pick up the sounds, so I have nothing to share from the event. After pouring over topographic maps, I noticed that many of the area's sightings happened in a natural choke point where a ridge line funnels down to a confluence of rivers. Following the lead of the Olympic Project, I decided to deploy trail cameras on this ridge line in hopes of capturing photographs of a sasquatch wandering its way down that route. This spot has human pressure for a good portion of the year, and the local sasquatches have adapted to keep their presence generally unknown. Vocalizations are rarely heard, and the creatures are reportedly sneakier in their behavior. I do not want more human pressure to make the sasquatches even more wary around us. I'm going to keep this location a secret, at least for the time being. For now, I'll refer to it as the Descending Ridge Location. The area between the confluence of rivers is virtually roadless. 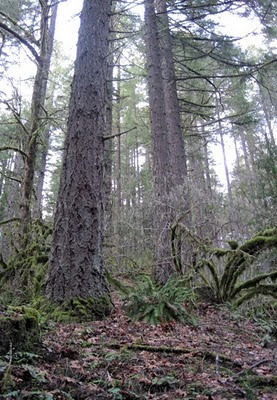 There are a handful of gated logging roads and trails that are slowly being reclaimed by the surrounding woods. Not a lot of people walk deeply into this area, and even fewer of them go off-trail. This is especially true in the winter. I felt that these facts would help ensure my cameras wouldn't get stolen. 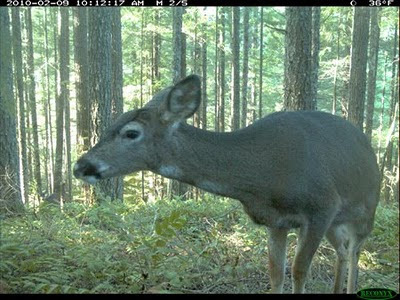 I hiked up the ridge line and deployed two Reconyx trail cameras. They were positioned to monitor heavily used game trails near a steep drop off, thus funneling animals into a narrow gap making them easier to photograph. 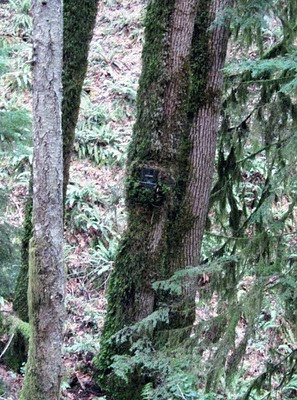 There was a human trail a few hundred yards to the south, so I spent a fair amount of time trying to camouflage the cameras with forest duff and moss. The just-deployed Reconyx captures us as we leave the scene. I put two cameras within a half mile of each other. They were left there for a month until I collected them this past Sunday on a solo day trip. I took a different route up the mountain when I returned to retrieve the cameras. I utilized a gentler slope than had been hiked previously, though it was still a bit of a climb. Eventually, and only with the help of the GPS, I found the two cameras. After unlocking them from the trees, they were stored carefully in my backpack. I brought another two units to deploy since I was up on the hill. Finding a precipice overlooking a shallow valley, I positioned one of them facing a game trail running along the overlooking ridge. Sasquatches, like mountain lions, use the surrounding terrain strategically, and this location would be an excellent one from which to locate prey. Having retrieved both cameras, and still having another to deploy stowed away in my backpack, I headed south. On the previous trip, I found a seep that trickled down into a narrow ravine. My intention was to travel down the seep to inspect the boggy spots for footprints. A flat spot off to the side of the seep. The ground alternated between a wet carpet of moss and a narrow stream with a gravel bed. In some places, the slowly widening creek disappeared underground. The gurgling of the unseen creek escaped through dark holes in the ground. You hear what's right under your feet, but don't see it. I found an excellent choke point on which to train the other camera. Lots of deer and elk had been moving through this spot, and it was only 20 or 30 feet wide. It will be interesting to see what utilizes this pathway after I pick up the camera next month. job at camouflaging a camera. I continued down the ravine. Its sides were quite steep now, and through the trees I could just make out a logging road a couple hundred feet below. I closely inspected flat spots where water had gathered, but for the most part I stuck to the creek bed and banks examining the soft substrate for signs of passing animals. Eventually, I made my way down to the road, hung a right, and walked back to where my truck was parked. Some local kids in a car rolled down their windows to yell something unintelligible at me as they passed, to which I smiled and nodded. It's always good to be friendly, even when drunk kids yell stuff at you. Perhaps especially when drunk kids yell at you. I was alone, after all. What I did get was a decent amount of information about what's going on in that area. There seems to be a good number of deer in the area based on both the photos obtained as well as the spoor seen on the hike out and back to retrieve the cameras. Based on footprints, elk had also walked through the area, though no photographic evidence of them was captured on this deployment. nose. It's easier to see in a larger version of the pic. Another from about a week later. Note the time stamps to the upper left. 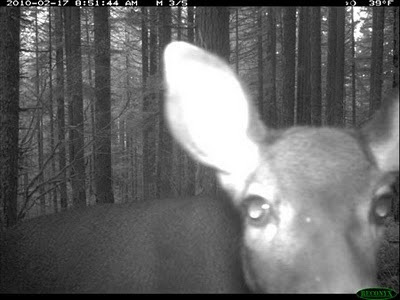 Having deployed two more cameras, I'll be heading out there again in about a month to pick them up. I'm hopeful for some interesting shots, and maybe even a picture of a bigfoot if I stick with this spot long enough. The more I get to know the area, the stronger that possibility will be. It's a promising location at a promising time. The animals are starting to move back into the area, and more are expected with spring just around the corner. 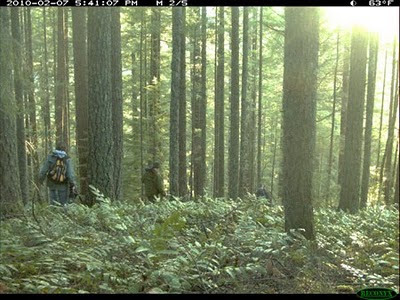 There are nearby ponds, numerous rivers and creeks, and a long history with many sasquatch encounters from all sides. Frequenting this spot, and keeping you posted on any results, seems like a good use of my time. 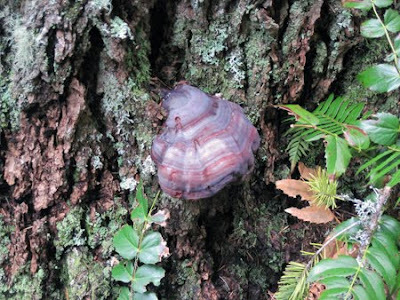 A beautiful example of Fomitopsis pinicola.